While most head to the Middle East to visit the playground of the United Arab Emirates, many overlook a quick side trip to another wealthy and luxurious Middle Eastern country, Oman. The country might not have the big name of its neighbor but it is well on its way. The culturally rich capital city of Muscat has enough sights, shopping and delicious eats to tantalize all your senses. Short flights from Dubai or Abu Dhabi to Oman, which can cost as little as $150 round trip, make it a wonderful getaway within a getaway, not to mention a boost for your passport stamp collection. Here are a few tips for a wonderful Oman escape! A scenic drive into the mountains of Muscat is just the first taste of the luxury that awaits you when you arrive at Shangri-La at Bar Al Jissah Resort & Spa. This desert oasis comprising of three hotels, sits along the hypnotic deep turquoise blue waters of the Sea of Oman and is the essence of luxury. With beautifully decorated guest rooms and suites, 24-hour room service, 9 restaurants, 3 cafes, 3 pool bars, 3 lobby lounges, 2 bars, a heavenly spa and the most breathtaking view, it’s hard to imagine why you would ever want to leave. Other Middle Eastern countries may be big on the flashing lights, but Oman is big on culture and nature. 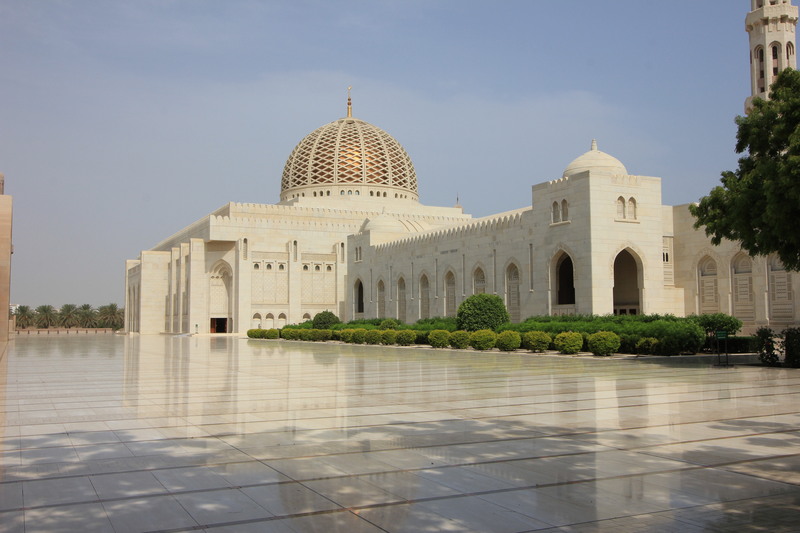 Your first stop should be to the Sultan Qaboos Grand Mosque. Don’t be fooled by its understated exterior, the inside of this mosque will leave you speechless. The Grand Mosque can accommodate 20,000 worshippers and the interior walls of the main hall are completely covered with white and dark grey marble. The beautifully ornate doors are inscribed with Islamic embellishments topped by Quranic verses in the Thuluth script, while other doors have stained glass panels to emphasize the harmony and unity of the space. The Persian carpet alone measures 70m by 60m wide, making it the second-largest hand-loomed Iranian carpet in the world and it took 600 women four years to weave. Next, be sure to envelop yourself in the beauty of Oman’s natural landscapes. A visit to the Bimmah Sinkhole, an hour and a half outside of Muscat, for a swim in the clear blue waters and a hike through the stunning terrain of Wadi Shab, are definite musts. If you’ve got a few jealous friends and family waiting for you back home, appease them with a few gifts from your adventure. Head to Mutrah Souq, one of the oldest souqs in Oman, and roam the narrow winding alleys in search of Arabian perfumes, spices, traditional cloths, Halwa (Omani sweets) and more. 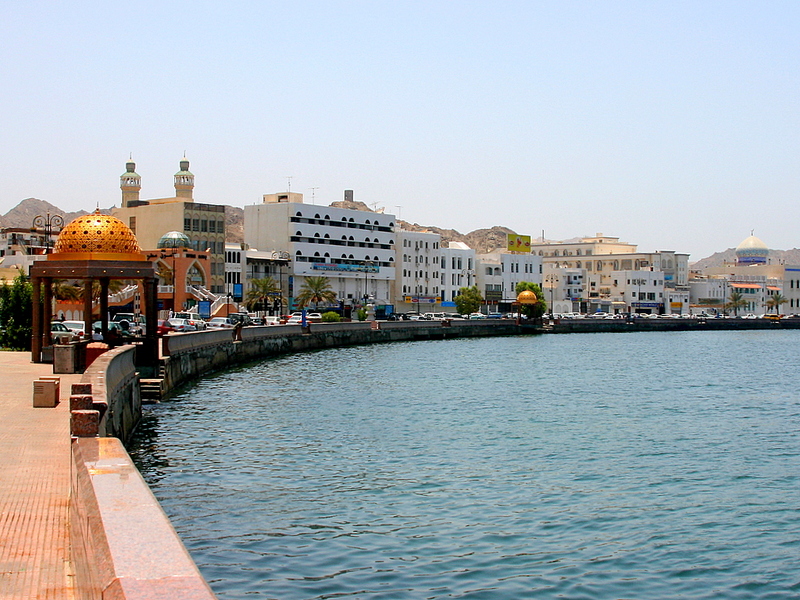 If you’d like a little more scenery with your shopping, then stop by Old Muscat and take in the relaxing sights along the Muttrah Corniche as you shop for trinkets. The food in Oman is just as diverse as its history. If you are looking to dive into traditional Omani cuisine then you’re in luck, because Bin Ateeq Restaurant boasts 65 traditional dishes on its menu. You can even get a real Omani experience by enjoying your meal while sitting on lush cushions. For a blend of Omani, Middle Eastern and Western cuisines try Ubhar Restaurant. Ubhar has received local and international acclaim for its unique and modern approach to Arabic cuisine, and is definitely worth a try. Looking for a veggie option? Fusion Restaurant offers a wide variety of delicious vegetarian options sure to leave you hungry for more. This is just a taste of what this amazing country has to offer. Take it from me, Oman is a must for any travel bucket list.